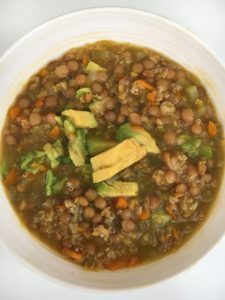 Lentil Soup recipe from Jen Martinsen at Nutrition Bliss. Heat oil in stock pot over medium heat. Add diced onions, stir occasionally until translucent. Bring to boil, cover, and simmer for 40 minutes. Garnish with avocado & parsley.